“The Spiritual Magazine” was a Christian Spiritualist magazine, published in Britain. This volume contains the issues from 1869. 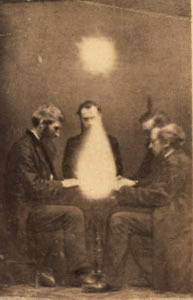 Most articles, unsurprisingly, deal with paranormal phenomena of various kinds, from ghostly apparitions and prophetic dreams to “manifestations” at séances. To gain legitimacy, the magazine often mentions scientists or people in positions of authority who are said to believe in Spiritualism: Queen Caroline (King George IV's queen-consort), Napoleon III (who supposedly communicated with the spirit of Napoleon I through a medium), Alfred Russell Wallace, Percy Bysshe Shelley, one Professor De Morgan, and high-ranking French diplomat Leon Favre. As for mediums, D. D. Home is mentioned frequently. “The Spiritual Magazine” is sometimes described as conservative, but in the issues I've skimmed from 1869, this tendency is less pronounced than in the 1868 issues. The editors still dislike Thomas Lake Harris and Andrew Jackson Davis, but they occasionally mention some of the latter's mediumistic feats in a positive light. That a radical like Shelley can be mentioned in a conservative journal is interesting. One of the letters condemning Harris is also pretty radical, denying Hell, substitutionary atonement and Sunday worship. But yes, explicit anti-supernaturalists like Ernst Renan are in for a whipping. The magazine is very positive towards Pietist eminence grise (or famme fatale?) Madame von Krüdener, often regarded as the inspirer of the Holy Alliance. They also like Sir Walter Scott, but condemn Alan Kardec for believing in such a non-Christian notion as reincarnation. The bottom line is still that all Spiritualist “revelations” must be brought in line with some kind of Christianity, presumably of the Church of England variety. This volume could be of interest to Spiritualists, historians of the movement, or people interested in the paranormal. Although I only skimmed it, I give it four stars.